It’s finally happened. After a long reign at the top, Microsoft’s Windows XP is no longer the most widely used desktop operating system in the United States, instead turning the crown over to Windows 7. 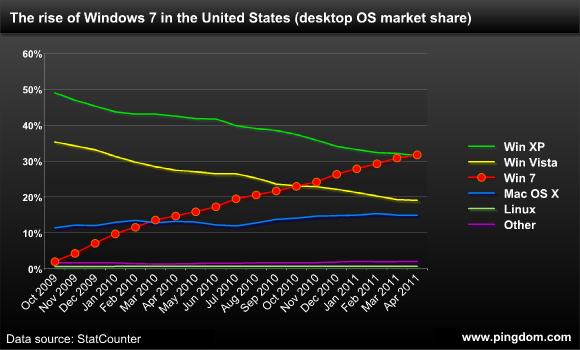 As of April, Windows 7 has 31.71% of the desktop operating system market, compared to 31.56% for Windows XP. The data is from StatCounter and consists of aggregated visitor stats from more than three million websites. In other words, this reflects the market share distribution of computers used to access the Web. The rapid rise of Windows 7 has been a massive success after Microsoft’s relative failure with Windows Vista (which never got the upper hand on XP). Since its launch in October 2009, the rise of Windows 7 has been straight as an arrow. Windows XP is still a big presence, especially in the corporate space where many have resisted upgrading, but Windows 7 seems to finally have set the upgrade train rolling. 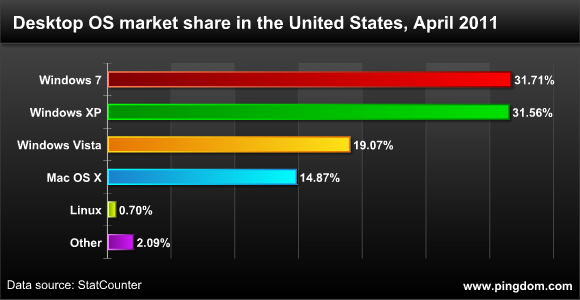 Worldwide, Windows 7 has a market share of 31.17%, while Windows XP still holds a significant 46.87% (now in April). So in this sense, the United States actually turns out to be a bit behind the curve. Windows 7 is just like Vista rehashed. Full of gimmicks and fancy tricks. Aero Snap? There’s a far better version in XP called Tile Horizontally or Tile Vertically that isn’t limited to arranging just two windows but any number you select. There are many good useful features of XP removed and broken in Windows 7. The file manager, Windows Explorer was utterly destroyed in Vista and becomes worse in Windows 7. Poor usability. See http://www.en.wikipedia.org/wiki/List_of_features_removed_in_Windows_7 and http://www.en.wikipedia.org/wiki/List_of_features_removed_in_Windows_Vista . Unnecessary GUI changes. Vista was innonative but horrible usability wise and removed things. Windows 7 is Vista with few new features and again many features removed and fancy gimmicks and shiny graphics added. People’s mentality gotta change. Old does not mean it stops working or degrades over time. Microsoft succeeds once again with forced obsolescence. After Vista, I was definitely wary about Windows 7. However, with the positive reviews pouring in, and no denying the success (as pointed out in the article above) of Windows 7, seems I may decide to give it a shot after all, although I love my XP. Guess it’s time to move on. Are you an idiot who doesn’t read how they collected the Data? what is is about the following sentence that you obviously didn’t read didn’t you understand? next time READ the OP before making a fool of your self! From my vantage point, people are loving Windows 7. Is XP still a good machine? Yes…but if the user is not savvy with system maintenance, then it doesn’t matter what the OS is, the computer is going to be slow, glitched-out etc. As for Vista, it really was a an “overloaded garbage barge”. Windows 7 is nicely polished and it allows so many older programs to easily install and utilize. If you are an XP user, hold on to it until Windows Updates stop. Then buy Windows 7 Home Premium (or higher) with Service Pack 1 installed. If your XP machine has dual processors and can hold 4GB of Memory, then just buy the Windows 7 DVD or download it from Microsoft Store. I never recommend an upgrade version, I always recommend getting the full disk and doing a clean install. When you’re ready to to enjoy DirectX 11 and a really fun 3D environment—jump to Windows 7! Going from XP to 7 seems to require less memory and give better performance than going from XP to Vista. Windows 7 works very well indeed in 2GB of RAM and its a fairly inexpensive way of giving a machine a new life which under Vista might have needed replaced.